Ready your outdoor spaces for a fun-filled summer of grilling, patio parties, and relaxing. Get inspired by these creative ideas for adding personality and practicality to your outdoor living spaces. Look for more ideas next week. Pictured above is Archival Designs' Luxury House Plan, Corrineaux Estate, and one of my fave outdoor spaces! 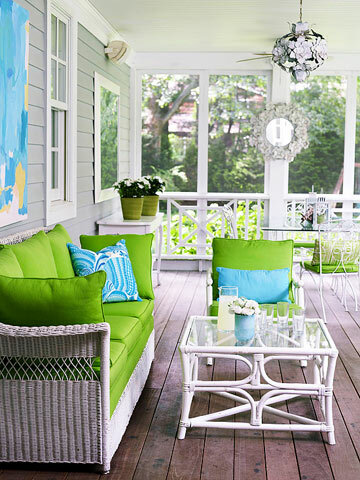 Lime green seat cushions and turquoise accessories infuse this screened porch with youthful energy. 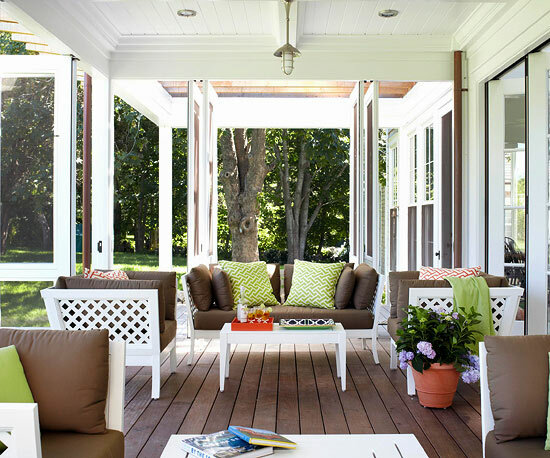 The mismatched collection of furniture looks cohesive thanks to white paint, which coordinates with the porch's white framing and the house's white trim. A large painting on one wall adds artistic flair to the outdoor living space. 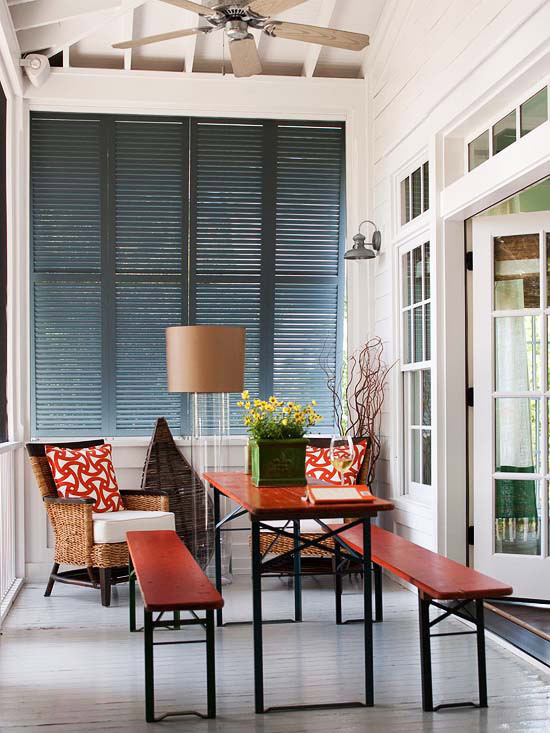 This sunny screened porch welcomes visitors with an eclectic collection of furniture and accessories. The cozy seat cushion atop the wicker sofa provides the perfect spot for relaxing. A trunk-turned-coffee table offers a surface to place a tray of drinks as well as a hidden storage area for blankets and spare pillows. A small skylight above the seating area in this indoor porch welcomes views of the sky. The wood paneled ceiling treatment draws the eye upward and emphasizes the skylight. Screened windows prevent unwanted critters from making their way inside without disrupting any views of the outside. In this sun room, simple, mission-style furniture gets a dose of personality thanks to a handful of colorful decorating touches. In one corner, a blue-painted chair contrasts the look of the other dark wood furnishings. A graphic area rug beneath the coffee table adds a splash of whimsy and helps ground the seating arrangement. 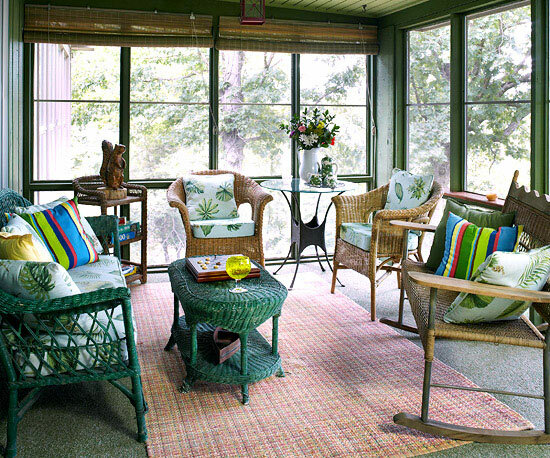 Wicker reigns supreme in this sun room, where the woven material infuses the space with an inviting and relaxed energy. The sofa and coffee table were painted a deep, emerald green, which adds whimsy to the ensemble of naturally finished pieces. The colorful rug beneath the seating area echoes the woven texture of the furniture. 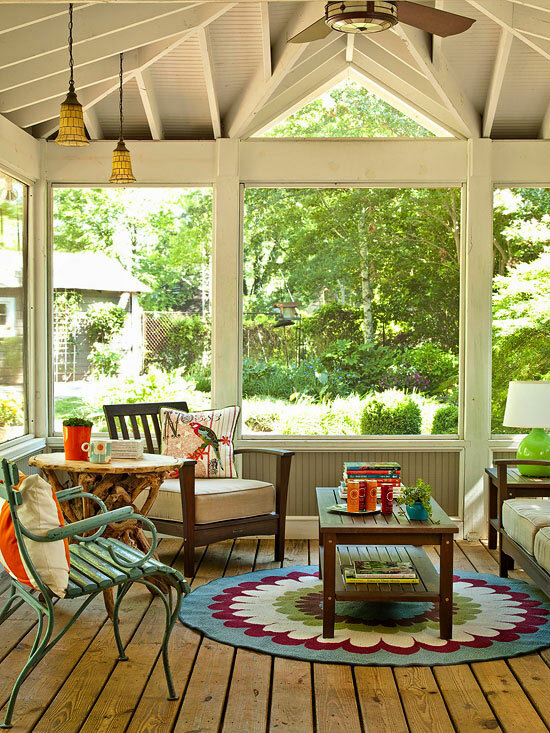 Collapsible screens allow this sun porch to transform from closed and protected to open and airy in no time at all. A trendy color scheme of chocolate brown, lime green, and rusty orange infuses the space with energy. The lattice pattern featured on the furniture adds another layer of visual interest. 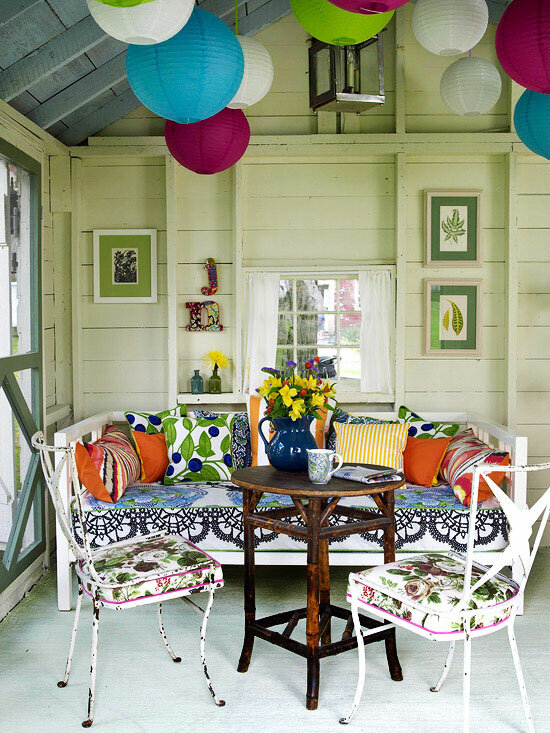 A collection of mismatched furniture and colorful accessories look right at home in this casual sun porch. The various patterns blend well with one another because they're all relatively similar in scale. Circular lanterns hanging from the ceiling tie in with the color palette and provide ambient lighting when the sun goes down. Striking orange accents add warmth to this indoor porch. Geometric-print throws on the armchairs tie expertly in with the orange-painted table and benches. The blue-gray shutters hung in one of the windows help cool down the warm orange hues. 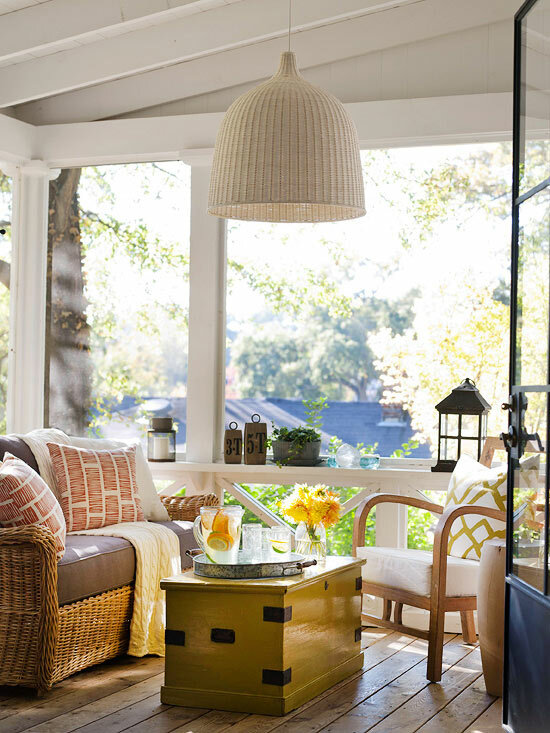 Styles collide in this unique, rustic-meets-trendy sun room. A dramatic stone fireplace surround and furnishings of weathered wood convey down-home comfort. Accents of mint green, such as the painted ceiling beams and upholstered sofa, incorporate of-the-moment style. 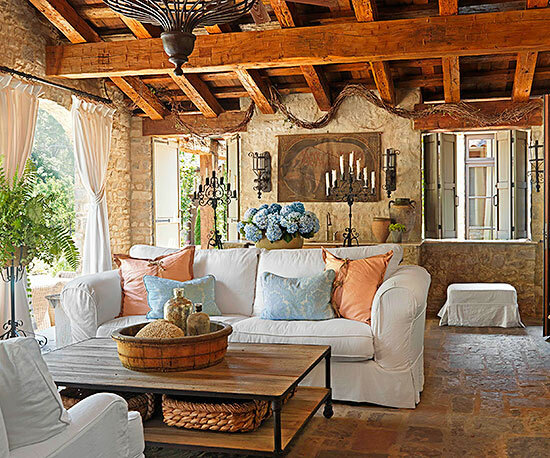 Reclaimed wood ceiling beams, wrought-iron accents, and stone flooring convey old-world style in this sun porch. French doors along one side of the room welcome visitors from the inside. On the opposite wall, heavy curtains can be thrown open to welcome fresh breezes or closed if the space ever feels chilly. 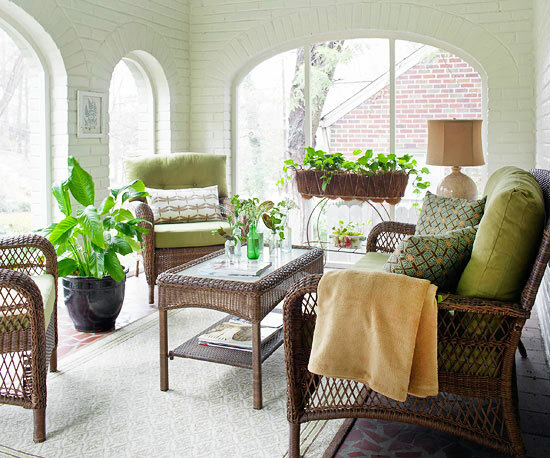 White-painted brick walls and large, arched windows welcome the sunshine in this sun porch. 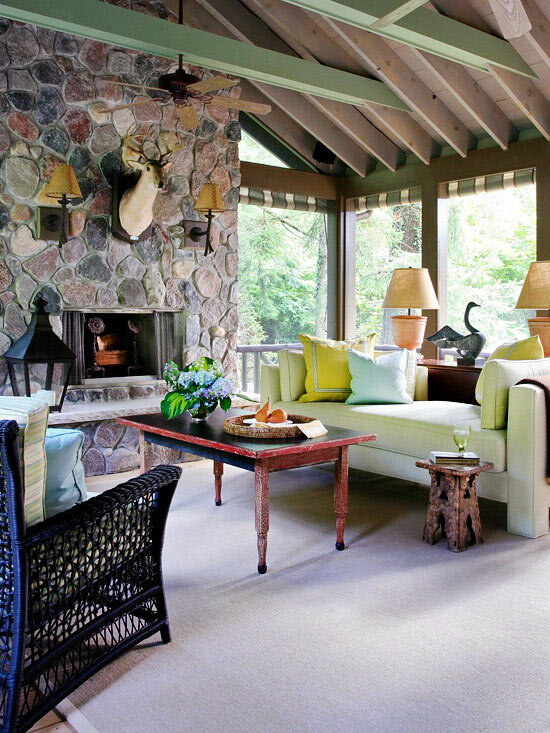 Wicker furniture, a staple of most outdoor living spaces, makes its way into the seating area. 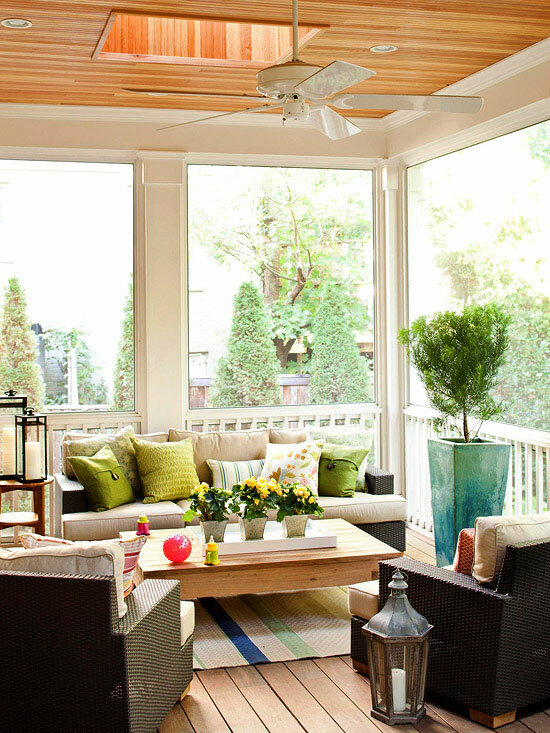 Accents of green, such as the seat cushions, blend well with the potted plants and container gardens. Choose from more than 400 house plan designs that we offer n a wide range of styles and sizes. Some of our more popular house designs include European-inspired Georgian and palladian homes, English manor house plans, Tuscan-style Italian villas, French chateaux, and colonial house plans. Our Tuscan-style villas range from 1800 sf to 14,m814 sf and Newport classic house designs range from 1500 to 5000 sf. Starter castles, mansions and estate homes are designed in the grand tradition of some of the most impressive homes in the world. Please feel free to search our house designs offered. Our plans have been built around the globe, from Canada to Dubai, and one could be just for you!